Grocery Outlet Bargain Market’s 7th Annual Independence from Hunger® (IFH) campaign has raised more than $1 million to provide over 500,000 meals to families in need. Throughout the month of July, Grocery Outlet customers, employees and store independent owner-operators across six states contributed food and monetary donations to help address critical food insecurity needs in their local communities. Learn more via Markets Insider. Reasor’s has reopened its store at 41st and Yale in Tulsa, Oklahoma, following an E-F2 tornado that struck the area earlier this month. Reasor’s sustained “minor damage and the loss of an air conditioning unit, which will be quickly replaced,” according to the grocer. Learn more via The Shelby Report. Lincoln, Nebraska-based B&R Stores was founded in 1964 as a partnership. In 1979, Russ Raybould changed the company structure to be employee owned. The creation of the ESOP (Employee Stock Ownership Plan) is being celebrated on Tuesday, Aug. 15, as Ownership Day. Learn more via The Shelby Report. Imagine trying to perfectly fill four grocery sacks while a group of your contemporaries and store managers watch your every move. Even worse, three know-it-alls are in your face with a clipboard and asking distracting questions. Then add a stopwatch ticking away and you have a very self-conscious 90 anxious seconds or so. Learn more via Amarillo Globe-News. This is the ritual in which professional grocery baggers compete to see not only who can piece together the consumer jigsaw puzzle of milk, eggs and produce the fastest. They also must evenly distribute the weight among their three bags. They earn even more points for technique and style (such as where they situate the soft bread loaf for maximum protection). Learn more via The Des Moines Register. For years now, social media has been a big deal for food retailers: Almost all are on social networks, while three-quarters are making significant or moderate investments in social-media-related outreach, according to research from Tampa, Fla.-based marketing and promotions management company Aptaris and Cincinnati-based analytics firm Dunnhumby. Learn more via Progressive Grocer. Global Market Development Center (GMDC), an association that connects its members to advance innovation in the marketplace, examines why non-food manufacturers should embrace click-and-collect rather than fear it in its latest next practice report: Connecting with Click-and-Collect: Strategic Upside for Non-Categories. Learn more via Grocery Headquarters. On-the-go produce snacking has become a billion-dollar business, and while some areas of the grocery store have struggled to find growth, that hasn’t been the case for this sub-category of the larger “snackable” fruit and vegetable segment, according to a new Consumer Insights report from The Nielsen Co. Learn more via Food Business News. According to Mid-America Real Estate Corp.’s biennial Urban Grocery Study published this month, the Chicago grocery sector showed a net loss of nine stores from 2015-17, totaling a loss of 544,512 s.f. of operating or to-be-opened inventory. Learn more via Progressive Grocer. Research shows up to 70 percent of grocery purchasing decisions are made in-store, making your merchandising strategy key to increasing basket size. Amidst ever-increasing competition, a great way to do that is to make shoppers’ experience more efficient by placing items commonly purchased together near one another. Learn more via Supermarket News. The retail world will change more in the next twenty years than in all of the history of modern day retailing. This is driven by the seismic shift in consumers’ shopping habits: they’re filling smaller baskets during each trip to the store; different categories drive consumers to different types of stores; and the ability to shop online for groceries is more prevalent than ever before, with the advent of services like Amazon Fresh and retailers boosting their digital fulfillment efforts. Learn more via Forbes. Which health claims are shoppers really seeking? While organic and non-G.M.O. claims are becoming more important to today’s consumer, calories and fat content remain the primary drivers of better-for-you snack purchases, according to market research firm Nailbiter. Learn more via Food Business News. Meal kit delivery services might not be making any money, but they certainly are staying on top of food trends. A new report from food analytics and consulting firm Datassential shows that meal kits are providing consumers with the new ingredient and flavor experiences they are seeking. 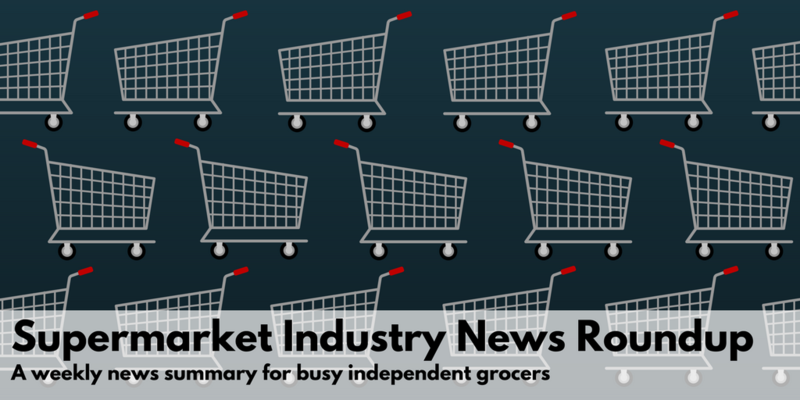 Learn more via Supermarket News.